CLEVELAND – The Coast Guard continues to monitor the response and salvage operations to a 656-foot freighter that has been hard aground in the downbound shipping channel of Lake St. Clair since early Sunday morning. Several attempts to refloat the freighter have been unsuccessful and five tugs have been dispatched to attempt to refloat the tug tonight. Initial reports indicate there is no resultant pollution and no injuries were reported. The Hong Kong-flagged freighter vessel Federal Rideau sits hard aground in the downbound shipping channel of Lake St. Clair near the Detroit River, July 28, 2014. U.S. Coast Guard photo courtesy of Coast Guard Air Station Detroit. 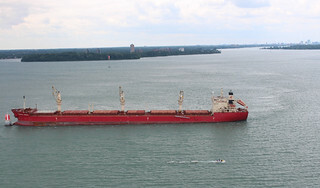 At around 3 a.m. Sunday, response coordinators at Coast Guard Sector Detroit received notice that the motor vessel Federal Rideau, a Hong Kong-flagged vessel, grounded in the downbownd channel in Lake St. Clair near the Detroit River. The vessel is carrying approximately 22,672 tons of wheat. Coast Guard marine inspectors from Coast Guard Sector Detroit Prevention Department responded to the grounding to assess the situation and determine the extent of any structural damage to the vessel. Coordinators at the Sector Detroit Command Center are in constant communication with the vessel’s crew and with responders aboard the ship. The vessel was en route to Montreal, Quebec, Canada, but will be taken to Belle Isle anchorage for an underwater survey. The cause of the grounding was determined to be a loss of steering caused by a motor coupling failure and repairs to the coupling have been completed. One attempt to refloat the freighter by two tugs was unsuccessful Sunday after one of the tugs experienced motor issues. Currently 580-feet of the grounded vessel is in the shipping channel but the channel is still open to traffic. Canadian Coast Guard Vessel Traffic Services in the Sarnia Traffic Zone is notifying mariners of the waterway obstruction and is directing one-way traffic in the area.